Cobaltite is a sulfide mineral composed of cobalt, arsenic, and sulfur, CoAsS. It contains up to 10% iron and variable amounts of nickel. Structurally, it resembles pyrite (FeS2) with one of the sulfur atoms replaced by an arsenic atom. Granular to massive, rarely as striated crystals, pseudocubic. Although rare, it is mined as a significant source of the strategically important metal cobalt. Secondary weathering incrustations of erythrite, hydrated cobalt arsenate, are common. The name is from the German, Kobold, "underground spirit" in allusion to the "refusal" of cobaltiferous ores to smelt as they are expected to. Look up kobold in Wiktionary, the free dictionary. It occurs in high-temperature hydrothermal deposits and contact metamorphic rocks. It occurs in association with magnetite, sphalerite, chalcopyrite, skutterudite, allanite, zoisite, scapolite, titanite, and calcite along with numerous other Co–Ni sulfides and arsenides. It was described as early as 1832. It is found chiefly in Sweden, Norway, Germany, Cornwall, England, Canada, La Cobaltera, Chile, Australia, the Democratic Republic of the Congo, and Morocco. ^ "Copper-Cobalt ores". www.danafloat.com. Retrieved 2018-04-04. Spencer, Leonard James (1911). "Cobaltite" . In Chisholm, Hugh (ed.). Encyclopædia Britannica. 6 (11th ed.). Cambridge University Press. p. 605. 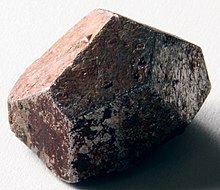 Wikimedia Commons has media related to Cobaltite.